R-S Theatrics has brought us back to the “forgotten” form of theatre- the one-act play. With Neil LaBute’s “Autobahn,” we’re treated to seven vignettes all captured in the front seat of America’s passion- the automobile. They’re tied together with a great cast playing several roles and by the element of surprise that LaBute brings to each story. 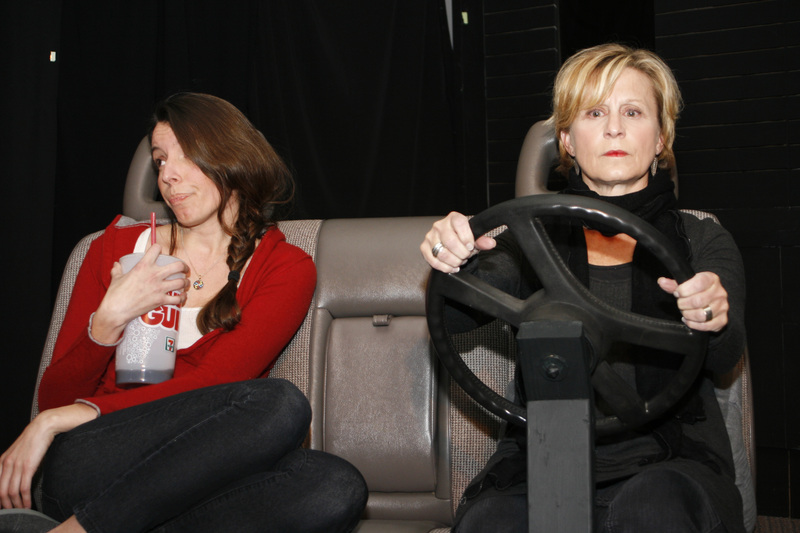 Ellie Schwetye and Janice Mantovani share a "mother-daughter" moment in Neil LaBute's "Autobahn" at R-S Theatrics. Betsy Bowman delights, particularly as the “Fatal Attraction”-type girlfriend who goes off on Phil C. Leveling as the surprised and nervous boyfriend who has brought her to “break-up” point for something more than making out. Mr. Leveling shows up again as a man hesitant to procure his video game from his ex while Jared Sanz-Agero drives him to Division street in a wildly, manic performance that provides the biggest laughs of the evening. Mark Abels also does double-duty as a rather creepy teacher who is driving his young student to a remote cabin (what was she thinking?) and then as an upset husband who can’t believe his wife’s story about a break-in at her hotel room while she’s away on a convention. Another classic LaBute punch comes at the end of this one. Caroline Kidwell is great as the innocent and increasingly nervous young girl while Janice Mantovani is a riot as the not so up-front wife. Caroline Kidwell and Mark Abels in R-S Theatrics "Autobahn." Four directors tackle these one-acts and some fine work by all including GP Hunsaker, Randy Stinebaker, Nick Moramarco, and Landon Shaw. This is an early work by Neil LaBute (2006) so you don’t encounter some of the mysogynistic and “Mamet-ism” of his later works. As a proponent of the one-act form- my early days in theatre were spent with the Hawthorne Players in North County and we had an annual “Night of One-Acts”- I’m particularly thrilled with “Autobahn.” Like “Almost, Maine” that Citilites produced last year, the one-acts are all related but make up powerful stories all on their own. R-S Theatrics’ Artistic Director, Christina Rios, also announced before the play that they have found a new home. As you may know, R-S Theatrics and Avalon have both lost their theatres (as have all the other art groups in Crestwood Plaza) with the new ownership of the mall. Although the season itself is still being finalized, R-S Theatrics will be moving into the Black Cat Theatre space in Maplewood. Right now, enjoy the laughs and surprises that only Neil LaBute can provide in this wonderful production of his one-acts, “Autobahn,” at R-S Theatrics through February 26th. Call them at 314-968-8070 for tickets or more information. I enjoyed your review of “autobahn” and look forward to seeing it next Sunday. I am very familiar with R-S Theatrics as their technical director for several of their shows. I do, however, take exception to your opening sentence, which reads, in part, ” …has brought us back to the “forgotten” form of theatre- the one-act play.” As you allude to in your review. several theatre companies in the greater Saint Louis area have been presenting one-act plays as part of their schedule for the past several years, either as an extended one-act (60 to 90 minutes) or as an evening of one-act plays. I have seen great one-act plays at Avalon Theatre, (the late) Echo Theatre and Soundstage Theatre, just to name a few. The theate company that I am mostly associated with (First Run Theatre)has presented evenings of one-act plays as part of seven of its nine seasons, and I am sure that, if you polled the 90+ theater companies in the greater St. Louis area (this includes college, community, non-Equity, and Equity companies), you would find that the one-act play is not “forgotten”; it is just not as common. Overall, I thought your article was objective, fair and insightful. You’ve made me a fan of your blog – keep up the good work.